There are several ways Teespring sellers can optimize their listings to sell through Teespring Marketing and the Boosted Network. Optimized listings can improve your products’ marketplace exposure and lead to more sales. An optimized listing can also help us prioritize your products for the boosted network because our team will be able to easily identify design themes as we search for more content to feature. Your listing title is the most important element you should focus on optimizing. Creating a unique, descriptive listing title is a great way to help shoppers find your products. An example of a good title is “I Like Beer and Fishing – Funny Hobby” because it incorporates keywords related to the design: beer, fishing, funny, hobby. These words are not only relevant to the design, but they are also words a buyer might search for. Keep in mind there’s no need to repeat keywords. This doesn’t improve your SEO when it comes to listings. Do not include words describing the product type, color, size, etc.—these elements are automatically incorporated into listings when they are added to the Boosted Network. Also, try to limit titles to five to eight words (40 character limit) and avoid adding words like “limited edition”, “over 1,000 sold” or “ending soon”. These words take up space, don’t improve SEO, offer no insight on what your design is actually about, and could even violate our false advertising policy. Make sure to translate your title if your design is translated. Learn how to get more EU sales on the Boosted Network here. It’s good practice to customize listing URLs with relevant keywords. For example, if the design is “Love my mom” and your default product is a shirt, try adding the words “shirt” to the URL so you get “teespring.com/love-my-mom-shirt”. If you don’t want to add the product to the URL make sure to add at least one or two keywords. Your listing description can help convert shoppers into buyers and make your products more discoverable within Teespring’s Marketplace. When writing a description try to include content that is relevant to the design. Also, use phrasing that could help a shopper self-identify with your design theme. Clearly, this is a design for grandmothers who like knitting. We recommend keeping your description short and concise as well—don’t add loads of text or random keywords and hashtags as this will make your listing appear spammy. We do not recommend adding random hashtags and stuffing keywords into your listing descriptions. This can confuse shoppers and make your listing appear spammy. Why is this a “bad” example? Nothing in the description is relevant to the design. 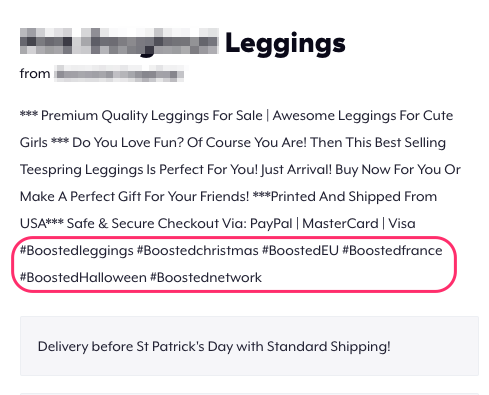 There are random hashtags that are not relevant to the design; it is not an EU product (so don’t add #BoostedEU), the design is not translated into French (so don’t add #BoostedFrance), the design is not a Christmas/Halloween themed design (so no need to add #BoostedHalloween or #BoostedChristmas). It looks like the seller intended this content to be spaced out, but it’s closely stacked and hard to read. When should you use hashtags? When we announce a hashtag promo and request certain hashtags (keep an eye on the blog for hashtag promos ~ see example). When your listing meets the criteria outlined in the hashtag promo. For example, we are asking sellers to add a “#French” hashtag to listings that are translated into French. This means you should only add this hashtag if your design is translated into French. Keep in mind hashtags are not necessary to have your products listed on the Boosted Network. They simply help us identify groups of listings we are interested in prioritizing for listing on the boosted network. Can I use #BoostedChristmas hashtag now, I mean in March month to get listed, So that I can get more sales in December? Hey Joy – that promotion is over so there is no point in adding the hashtag. I have upload a design. how can i sell design.Please let me know. There is a button the says “Continue” at the bottome left of ther screen. If I search for aqua meow, I get random results for not my product. Please advice! Hey Trishna – marketplace search results are ranked based on an algorithm combining buyer search terms, listing keywords, sales history, and seller trust scores. To increase your ranking in search results we recommend optimizing listings, driving sales, and complying with our design policies. Learn more about trust scores here. I have been marketing items on Teespring now for a little over a month. I have a store front. I have very cute designs. I know my audience(animal lovers), and my store and all my campaigns are animal themed. I have only sold three things so far. I have boosted my ads on Facebook and done some Promo’s on Pinterest, and people LOVE my designs, and I had one lady send me a message about one of them and say, “I want it!” I responded and told her about my site a little more and gave her the link and told her I would look forward to doing business with her!! I still cannot get people in there to buy. I have my products on Instagram and Google+ and Twitter as well, plus I have a free listing on Bing and a free Google page. I just need to receive my verification codes and apply them. I put key words in all the campaigns( up to 10, not hashtags in the description). I am so disappointed. I had some people say that on average it can even take anywhere from a year to 2 years to get your stuff out there and build your business. I just can’t get people in there to buy! I will admit, my products have a lot of detail and are one of a kind with cuteness!! I know I’m giving myself a pat on the back. But, I need it! I am working to get even more products made for my store. I love to make the different designs! But, what can I do to build my business?! I would be happy to give you my email, if you would please take a look at my site. Hey Dana – don’t give up! People don’t find success overnight. It’s important that you take the time to learn the difference between creating a cute design and creating a design that people connect with (they see it and think “hey that’s me!”). This is where most sellers are able to unlock success and sales. Thank you for the encouragement! I really appreciate it. If I just got one sale, I would be happy! It’s actually been about 2 months since I first opened my Teespring account, but I’ve just recently gotten up to 11 campaigns, and I still don’t have any sales. I also am wondering how to use a hashtag. I put #MothersDay2018 right after the body of my description. When I look it up as if I was a consumer, it shows #MothersDay2018 right after the body in my description. I don’t know if that’s right. That is a beautiful butterfly shirt!! I am a newbie with no art experience but with a desire to learn. I know it is difficult, but persevere and I know you will find sales and success! Bonjour j’ai remarqué que dans le lien que tu vienne de partager que vous utiliser les papillons dans des t-shirts d’homme déjà sa c’est un problème la plupart des mecs ne s’intéresse pas au papillons, et puis commence à apprendre et lire des livres/cours de marketing, et de design aussi, et puis le Facebook ads chaque domaine d’entre ceux là est différent alors apprend peu à peu et ne met pas l’objectif de votre store qu’il te ramène en fin de journée un cashback, le but est de prendre au besoins au client c’est le plus important et être sérieuse dans ton travail, ce n’est pas par-ce-que t’aime les animaux cutes et tu les dessine ( design ) .. qu’ils doivent se vendre, j’espère que tu fait un planning de ta journée pour apprendre et pratiquer ta passion et dans des mois de travail dur et de patience t’aura ce que tu cherche 🙂 bon courage Diana j’espère que je t’ai aider un peu même moralement. Thank you so much for encouraging me! I really appreciate it! You don’t know how much that means to me. There are a lot of my designs that I want to buy! Haha! How do you use a hashtag on Teespring? I know that sounds like a stupid question. I’ve been trying to figure this out all day, and there is nothing on this site that really explains where to type it in. Do I type it right below my description of the campaign?? If I do that, it just shows a hashtag, like I typed in #MothersDay2018 right in the description box of my item. It’s typed in right under the body of the description. But, I feel like I’m doing something wrong. I don’t see hashtags on anyone else’s campaigns. This might be a duplicate question, and I apologize, but I can’t find the original. Hi I need some help to marketing my T shirts. Is there a way to change a URL once a campaign is launched. I want to go in and add the word shirt or tshirt onto my URLs, but not certain how to do this. Any help is appreciated! Thanks! Hey Janet – I don’t believe you’re able to edit the URL from your account. You can try reaching out to campaigns@teespring.com for assistance though! Who can i sell t-shirt in pinterest please any one help me. Who I add campaign tittle ,description, url, and tags. What kinds of technique behind it for higher sale. writing from Germany, after reading the introduction on out to boost our listing on what to do and not to, I discovered my listing words and description are not proper written by me. Can I edit it and correct the listing and description since they are teespring live now. Hey Justin – we optimize listing title/descriptions for you. Are you saying the translation is incorrect? hey guys can i use a funnel with teespring? I’m new at this and just got started last week. So much to learn and read. I want to make the right moves. What do you suggest for a new Teespringer? What should I do fist? I do advertise on FB but that is not enough. I was stoked in having my storefront and started a few campaigns so far. I marketed in Twitter and FB. I even posted in Instagram. Many people ‘liked’ it however nobody purchased yet. Please show me how to market and to reach larger audiences? i can’t sell my tees..can anyone help me with marketing?? hi, I’m a newbie of about a month, I’ve created up to 2 designs but don’t know how to promote them. pls, help. I want sales to help my newborn baby. you can also help me check ELITE STORES for your advice on my designs. Hello, “listed” means that your campaign is now active and that others can search for and find your designs on Teespring. What is the fastest and most interesting way to promote my collections through my network and the platform? Hey Dario, lots of our sellers use their personal and business social media accounts to promote their products. Happy selling! Hi, I need help. I do not know how to modify the clothing on Teespring. I would like to lower the prices of each t shirt, etc. and then improve the title description and other details. But I do not know how to do it, is possibile have give me some indications to as proceed? 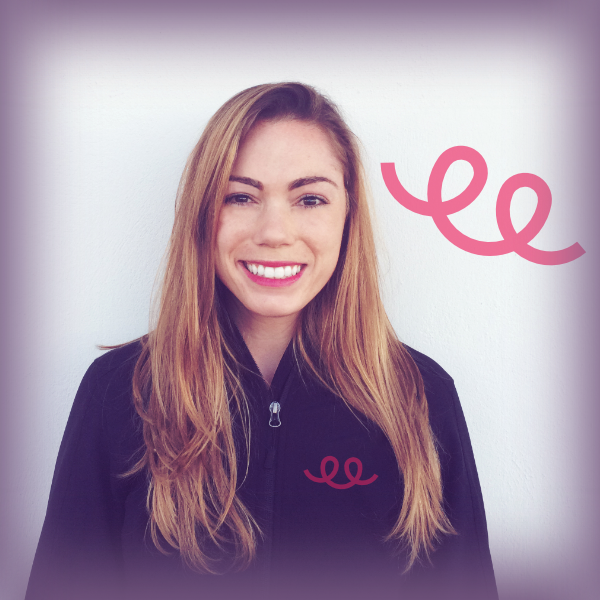 Thank you Kate for sharing valuable techniques to make a good impression on prospective buyer. I have drastically improved the writing aspect of the listings. Hey Mike, we’re adding hats to sellers’ launchers on a case-by-case basis. Be patient and continue making sales to unlock hats! Hi, I am new and just started with Teespring. At the end of the design process and the Listing is confirmed, it pop up a page where I can pay 0.50$ to sell on Amazon, etc. What is that option? For every campaign is only 0.50$ to boost my T-shirt’s campaign and sell on Amazon or Ebay? I can’t find any information to confirm or how this payment is involved? Please help me.Thanks. Hey there, this is through our Boosted Network. You can find more information on this process here.